You wouldn’t know it by looking at it, but this cake is lousy with strawberries. Andy and I picked up a pound of berries from the farmers’ market (they were picked yesterday!). So springtime-y wonderful. This has become one of my very favorite cakes. I made it for the first time a couple months ago and have made it three times (!) since then. I, um, like cake. The first time I made it, I just happened to have all the ingredients on hand (most are standard pantry ingredients), including a fresh pint of raspberries because I like to snack on them, and buttermilk because I had just made chicken fried steak and cream gravy with cube steak from the farmers’ market. This cake comes together in no time. Really, it is profoundly simple. And when you’re finished baking and cooling it there’s nothing more to do than to devour it- no stacking/frosting/dusting. It is delicious and perfect just as it is. 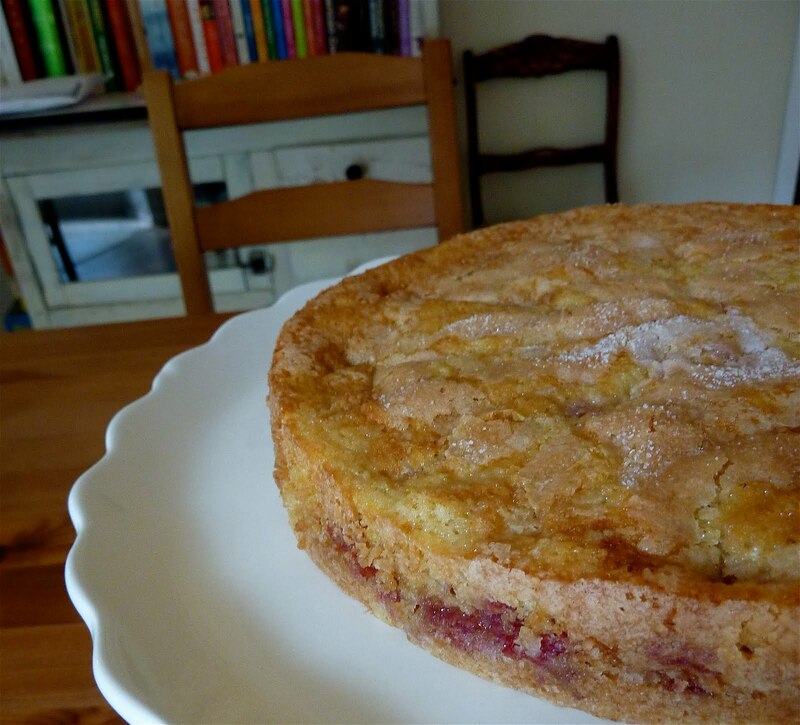 Next time you have a hankering for a lovely country cake, give it a go! At low speed, mix in flour mixture in three batches, alternating with buttermilk, beginning and ending with flour, and mixing until just combined. Spoon batter into cake pan, smoothing top. Scatter berries evenly over top and sprinkle with remaining 1 1/2 tablespoons sugar. Bake until cake is golden and a wooden pick inserted into center comes out clean, 20 to 25 minutes. Cool in pan 10 minutes, then turn out onto a rack and cool to warm, 10 to 15 minutes more. Invert onto a plate. Eat feverishly. I wish I was there. You are making it very hard for me. That cake looks amazing. yeess, yeesss! all according to my evil plan! i will lure you here with cake! Made this cake on Friday. SO YUMMY!! Dax thought so too. He jumped up and ate half of it!! Long story short, I hereby declare this the best damned thing I've ever made. Thanks so much for pointing us to the recipe! hooray! i'm so happy that the stars aligned so you could make this cake, and i'm thrilled that you liked it! also, fried chicken, iced tea and strawberry buttermilk cake sounds like the best meal ever made.